A couple of steps back in the timeline panel to visit a "Series III" set. 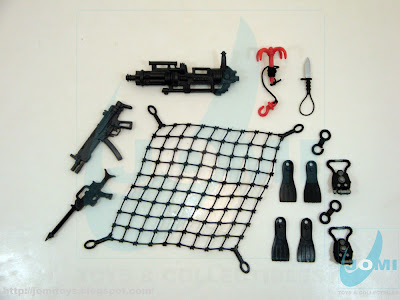 Series III brought a lot of new "goodies" for Police and Soldier Force lines. The SWAT/MP truck, a new attack helicopter and some more. Today, CM produces a lot of great stuff for all tastes and ages. 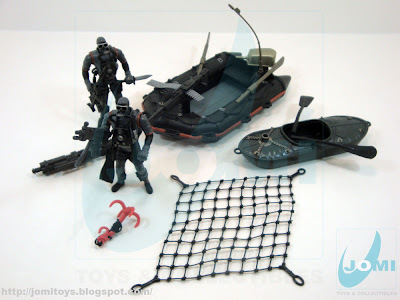 Back then, it was sets like these that kept their pockets with some investment money. Playability was a top concern and maybe, just maybe, their mind was set on a future long-term goal. Aiming at 3 3/4" collectors. Then again, it may have been plain coincidence. Somehow, I believe the 1st notion is probably more correct. 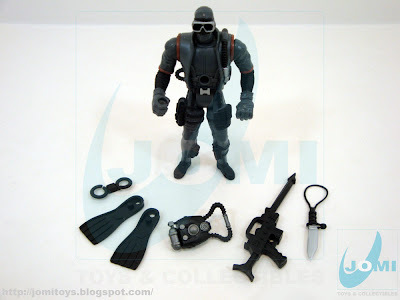 The first CM frogman (and still used today alternately with its "successor" with movable feet/flippers) . One of the first signs that Chap Mei was building up. 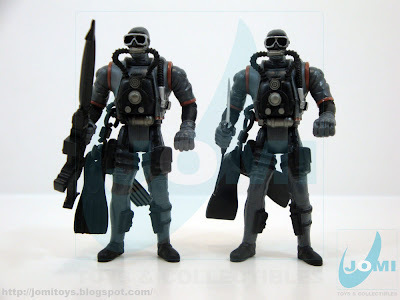 Used in this very same color scheme both with Police and Soldier Force themes. 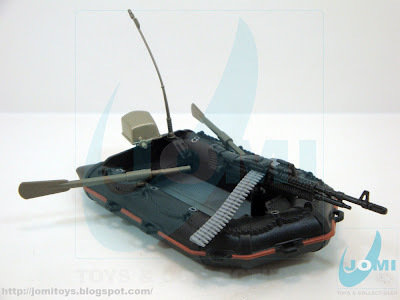 Nice details, slim body, and tons of custom possibilities for 1:18 scale collectors. 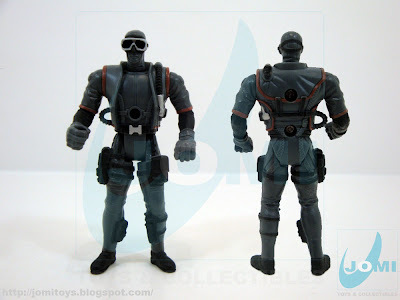 The fact it was a "uniform" figure, makes it army-builder compatible. 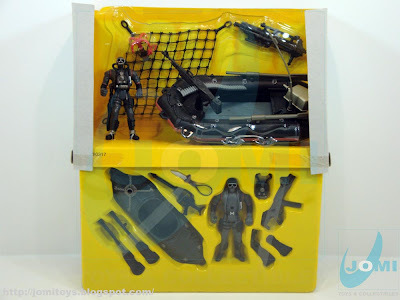 Later, with the introduction of "Rescue Squad" theme, this mold was re-used to form "Dean Octogear", the rescue diver for that line. 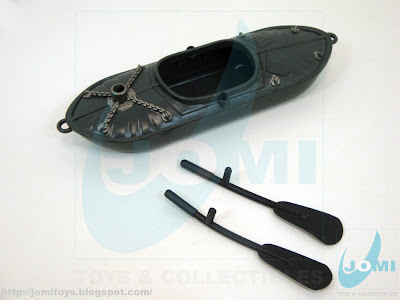 "Kayak" with 2 paddles instead of the typical "double-bladed paddle". 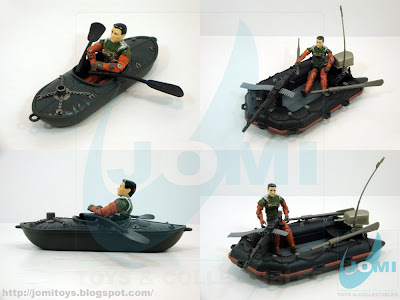 Some specialists may call this is canoe, but it´s really not that important. What is important is the fact that this was another Chap Mei bread & butter items for a long time. Mainly their first 3 series of Soldier and Police Force. Raft. One of the most wanted crafts then. 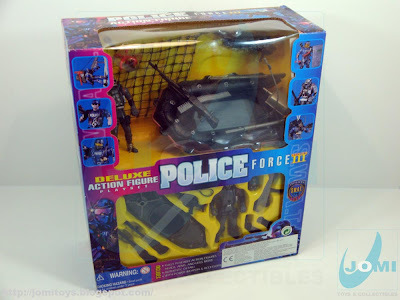 A lot of play sets sold because of its resemblance to the 1985 "Cobra Night Landing" G.I.Joe vehicle, and for more detail on this one, refer to "Police Force Patrol Unit Playset - Speedzer".